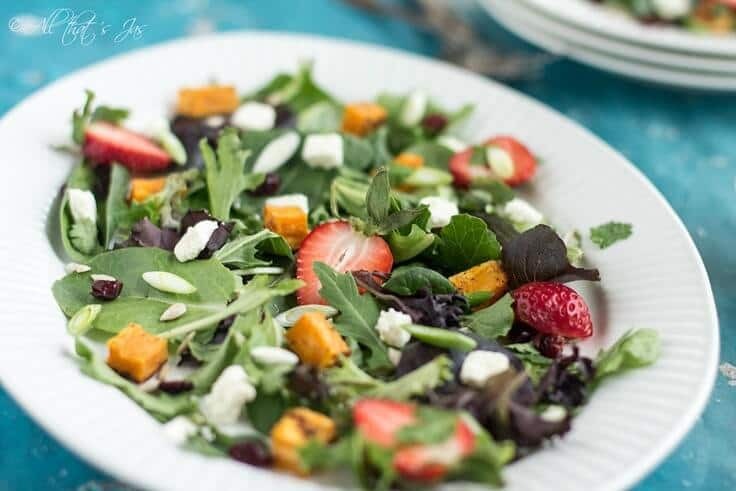 Who needs expensive restaurant salads when you can easily make them for a fraction of the price? 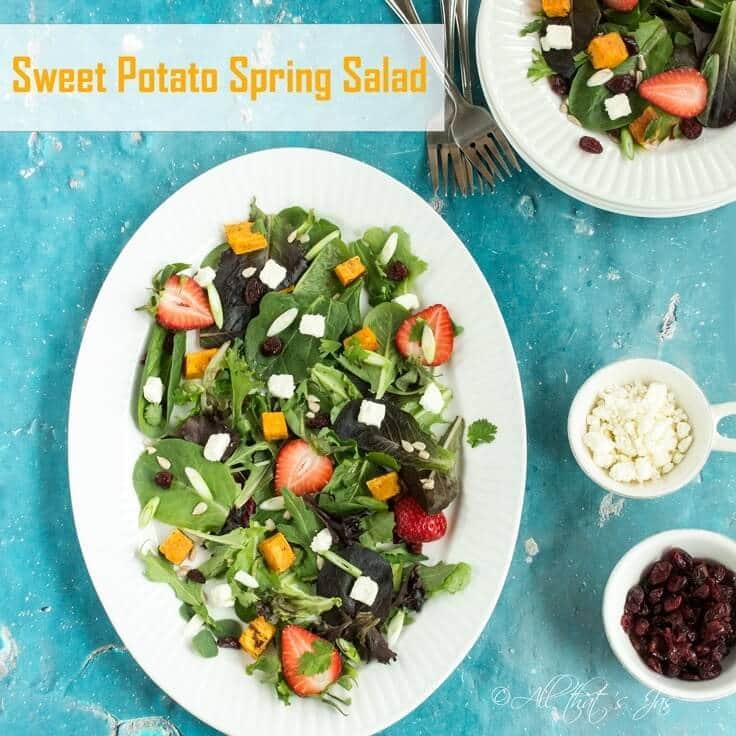 This Sweet Potato Spring Salad is refreshing yet satisfying and I promise it’ll become your family’s favorite. Hi there! 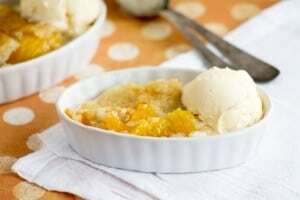 This is Jas from All that’s Jas and I am beyond excited to share my recipe here. 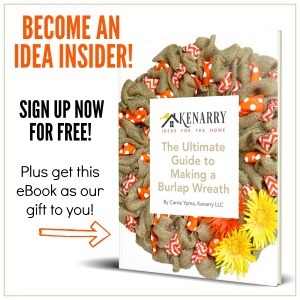 This is my first guest post and I am honored that Carrie picked me and trusted my contribution to be good enough for Kenarry readers. I like salads that could also be served as main dishes like these Tuna Ravioli and German Tex-Mex from the Ex salads. I also favor cooking at home as opposed to going out but when we do I go for something that I don’t know how to prepare or it takes time. I order a salad when I want a light appetizer or a side dish, never the entree. My husband, on the other hand, likes to order soup and salad. What? We could’ve stayed home for that! But to each his own, right? Share your must-have dish at restaurants in the comments below. Mine is either steak (because I always overcook it due to not liking my meals being half alive, lol) or fish because I can never have enough. 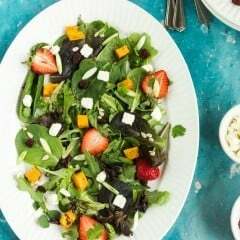 We recently, literally, stuffed our faces with this sweet potato spring salad I served alongside my other favorite meal, Pasta alla Norcina, and homemade artisan bread. Just ask my family members how good it was, they can all testify. Ok, they might be just a tiny bit bias, so you better try it and judge for yourself. Try this salad with Carrie’s Best Homemade Meatballs and it it will double-rock your world! Who needs expensive restaurant salads when you can easily make them for a fraction of the price? 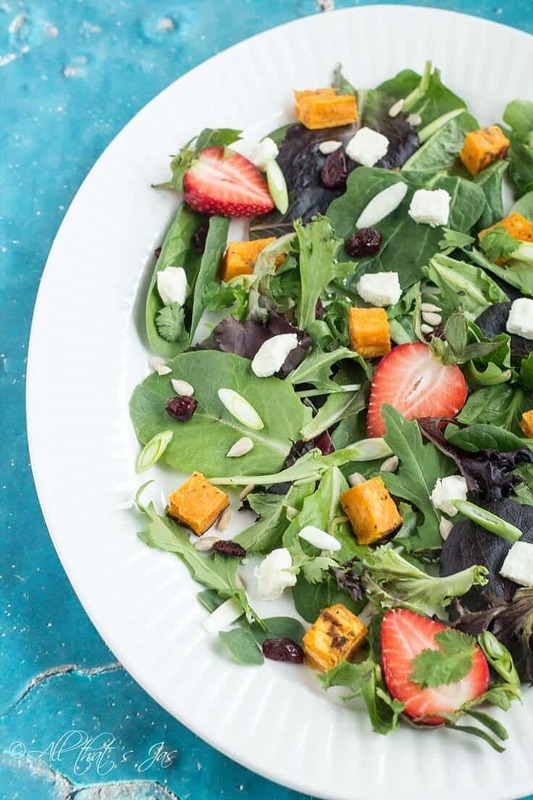 This Sweet Potato Spring Salad is refreshing yet satisfying and I promise it'll become your family's favorite. Preheat oven to 420 degrees Fahrenheit. Rinse and chop potatoes into bite size cubes. Toss potatoes with salt, pepper, oregano, cumin and oil. Place the seasoned potatoes on a large cookie sheet (do not crowd them otherwise they will not roast evenly). Bake until the edges start to turn darker, about 20 minutes. Meanwhile make the dressing. Mix all the ingredients in a small mixing bowl, except the oil. Adding drop by drop to start, gradually whisk in olive oil; whisk until dressing is thick and glossy. Place greens on a serving dish. 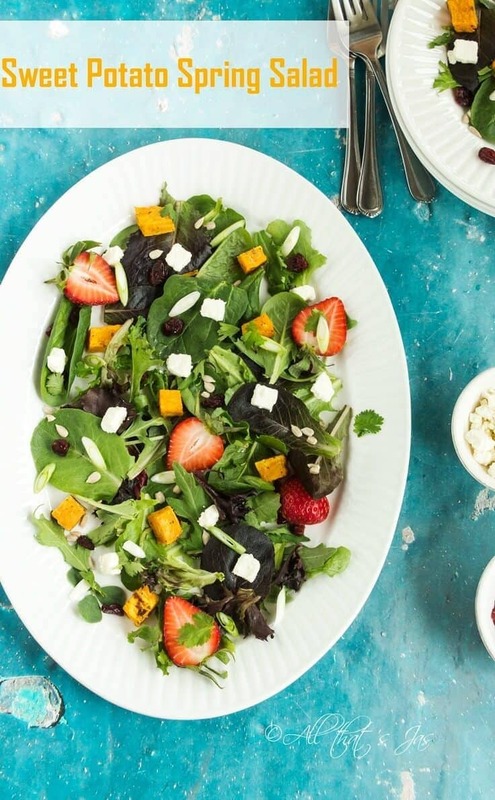 Top with roasted potatoes, crumbled feta, chopped green onions (white and green parts), sliced strawberries, cranberries, sunflower seeds, and cilantro. Before serving, gently toss with the dressing. 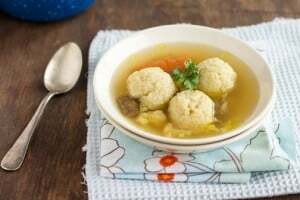 If you, like my husband, are happy with just a soup and a salad, I would suggest the light and perfect for spring Beef Soup with Semolina Dumplings. Hope you will visit me and find more interesting recipes, read some of my stories or just look through my photography. Either way, I would love to have you! Jas is a Bosnian expat living in Northern Indiana since the summer of 1998 following a six-year exile in Germany. When she's not busy cooking she is photographing, birding, spending time with her family, reading, writing, spoiling her dog and tending to her vegetable garden. Her blog, All that’s Jas, shows she's creative with all kinds of different trades. If you'd like to learn more what Jas does and make friends, connect with her on Facebook, Twitter, Pinterest or Instagram.